MAPS along with “Voices of the Bosnian Genocide” have put together an esteemed panel of experts to reflect on and discuss the ethnic cleansing and genocide that occurred in Bosnia only twenty years ago. What does the future hold for this nation that survived genocide? 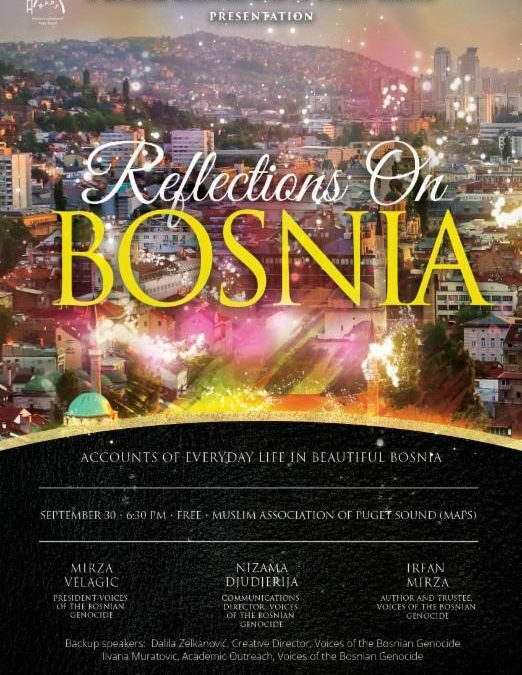 The event includes a presentation, “40,000 Years of Bosnian History,” by Irfan Mirza, an advisor to the United Nations field office in the region during the war. Following will be a panel discussion on the “Current State and Prospects for the Future of the Bosnian people” with panelists Mirza Velagić, President, Voices of the Bosnian Genocide; Nizama Djudjerija, Communications Director, Voices of the Bosnian Genocide; and Irfan Mirza, Author and Trustee, Voices of the Bosnian Genocide. The program is free and open to the public. Bosnian delicacies will be served along with coffee. Please RSVP.